You are here: Home / Blog / Spring is Springing in Santa Barbara! Previous Post: « Thank YouT&G Interiors !!!! for such lovely compliments! Felt like I was looking into Howard’s End, where you’ve hung the new antlers. Is the ancient azalea a ‘George Tabor’? I’m thrilled you like the deer! I have no idea about the azalea???? It is 60 years old! How would I find out? Everything looks so beautiful in your garden right now. I am going to try to grow some roses in my garden this year, but here in SW Florida they are not very vigorous. Cannot wait to see the mallard’s babies. Penny, your property is a beautiful slice of heaven!! Its always so rejuvenating to walk the grounds and to see your ducks who are probably going to be proud parents any day now! I can’t believe they managed to get the kids from last season to go find their own ponds!! Such joy, Penelope. Merci beaucoup, it is infectious!!! Thank you for the lovely tour of springtime in Santa Barbara. I miss southern California so much, especially this time of year. I used to tell people that you could smell spring in the air. I could always feel the change of seasons and they were lovely. Oh thank you so much……PGT! The doggies are allowed on everything! and all 7 grandchildren! That is the joy of life! I really cannot tell you how much I loved meeting you! So glad you enjoyed this! Come to California again soon!!! I forwarded these to Mary in NYC again! She loves your garden and, of course, the house too!! I’d love for you to meet her and she’d love to meet YOU! Incidentally, the ivy cloaking your house, I believe, is Virginia Creeper. It looks like what we had when I was a kid. I know it loses leaves in winter and ivy doesn’t. These Pictures go into my PHOTOS section. It’s my ideal garden!! Recently; I have been told “Boston Ivy” is the right description! Maybe the “Civil war” had to do with it! My Grandmother was a “Daughter of the Confederacy!! !” Shall I show up and join? Your house and your garden are just wonderful!! I love that long table with the beautiful French iron chairs around! What a gorgeous place to sit! Everything around is so beautiful! I love your house interior too!! So very charming!! Your house would be a perfect place to take movie shoots! Greet! Thank you so much! Brooke and Steve have told me about visiting you and how lovely your heavenly place is! My granddaughter; and my mother have both told me their favorite city in the world is Bruges……in Belgium, of course! Thank you so much for your compliments! I hope to visit your country soon!!!! Your garden is in full bloom! Patina Farm needs to be covered in Virginia Creeper! It’s so romantic. I have no doubt that your dovecote will be filled with chirping babies as soon as the doves find it. Your property is animal paradise. They all flock to you. Dear Penelope, thank you for sharing these impressions about spring time from the beautiful places where you live… no worth living without notice these details. An azalea growing up with your life… so full of love, and poetry. As you are, always. As a SoCal gal I agree! The only season we miss is winter. I love your house, inside and out and your grounds always reflect the beauty of any season. The iron trophy is wonderful. Thanks for the tour. Love the dogs on the chairs! Penelope, Absolutely Glorious! Thank you so much for the tour. Just what I needed today! Happy Monday! N.G. Penny, absolutely gorgeous!! 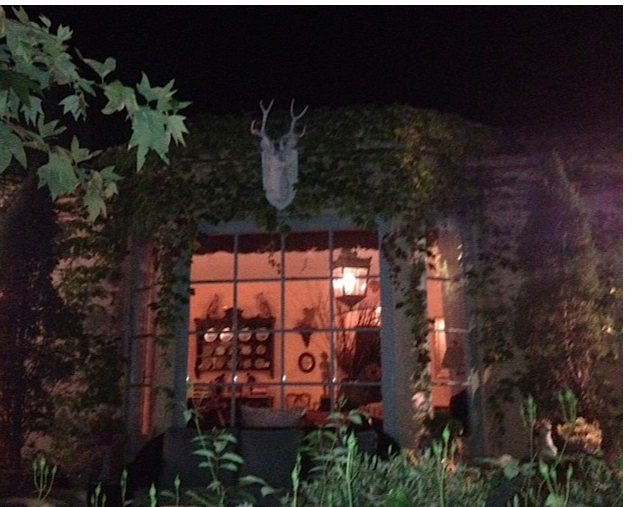 Love the deer head and the gardens…are beyond description…. so beautiful! Tara is right about quality accessories for the garden, If they are not fabulous, they are not worthy of a space. No worries with you, however, your taste is flawless. So glad for the update on “chick lit”! Spring has, indeed, sprung. Strangely all at once. Love the new addition of the deer. Can already see him decorated for Christmas! Hope all goes well with all that life popping up all over! I think your climate is the most perfect in America. I wish you could! We are coming to your neck of the woods September 17th! for a week! I hope you will be there! BEAUTIFUL ….. makes me want to come visit NOW. Having 3 of the 4 seasons and missing out on winter isn’t a bad deal AT ALL! Where did the deer trophy come from? (my stepdaughter in Marblehead Mass.! Penelope, your home and gardens remind me of an enchanted home in a fairy tale. I love it all. You find the most wonderful pieces to add such interest to your plantings and home. I do love the look looking from the outside in, makes it look intriguing, great idea. Actually, everything looks very intriguing, thank you for sharing. Can’t wait to see your summer view. Discovered KellyHarmonDesigns.com this morning. I’m slow to the party sometimes! Just following back to say how much I enjoyed your comments on Tara’s blog about the “poverty cycle.” When I decided my hillside garden was too precarious for my dotage, my neighbor across the street took all of my plants and replanted them in his back garden. When I excavated the clay soil to put in stone walls and terraces, he took all of my crud soil and he used it to build up a pond area. We both are happy and nothing went to the land fill. Don’t you just love the fragrance?